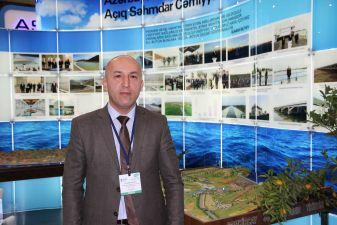 - We are a constant participant of the International Caspian Ecology Exhibition, and we have developed close partnerships with the Ministry of Ecology and Natural Resources of the Republic of Azerbaijan. Our company implements the “Təmiz Qida” (“Clean Food”) programme and is attentive to the protection of environment. Our work is related to water and forestry, therefore environmental issues are the focus of attention for us, and we apply innovative approaches in their solution. At this exhibition, we are presenting large-scale projects. On October 22, 2018, the opening ceremony of the 54-kilometer Araz water channel took place in Imishli, where the President of Azerbaijan was present. The project required 80 million manats as an investment and is designed to provide water to 53,000 hectares of land; it will bring great benefits to farmers in the Bilasuvar, Imishli and Saatli regions, and later, in Sabirabad. Previously, we successfully completed the project “Reconstruction of the drinking water supply system in Lerik and the creation of a sewage system.” As you know, Lerik is famous for its ecology and long-livers; even there is a Museum of Longevity in Lerik. I will also note our contribution to the work of the agropark in Gakh that opened on October 28. This year we implemented several more water projects, and we try to comply with the requirements of the “Green Economy”, when building canals along forest belts. We also undertake appropriate environmental measures on a yearly basis. In particular, we conducted such measures in the Agdash and Saatli forest zones, and in the coming years these environmental measures will be continued.